Established members of the Chinese national team, Xu Xin and Ding Ning start as favourites to arrest the respective Men’s Singles and Women’s Singles titles at the 2018 ITTF World Tour Asarel Bulgaria Open in Panagyurishte on Sunday 19th August. It is not only their history of success in the past decade that supports such an assumption, it is also the impressive manner in which they have progressed to the title deciding contests; neither has been severe threatened. At the final hurdle Xu Xin, the no.2 seed faces Japan’s Kenta Matsudaira the no.7 seed on what for him will be a busy afternoon; also he appears in the Men’s Doubles final in partnership with colleague Ma Long. The no.2 seeds, likewise opposition from the Land of the Rising Sun awaits; they meet Masataka Morizono and Yuya Oshima. Meanwhile for Ding Ning, the no.6 seed, she faces compatriot Wang Yidi in the Women’s Singles final; a somewhat surprise name, she started her journey five days earlier in the qualification tournament. Similarly, there is a surprise pairing in the Women’s Doubles final; also from China, Liu Gaoyang and Zhang Rui meet Japan’s Kasumi Ishikawa and Mima Ito, the no.3 seeds and defending champions. Conversely for Kenta Matsudaira, it is his fourth ITTF World Tour Men’s Singles final; the previous appearances being in Austria when he beat Hugo Calderano in the final and in Bulgaria where he was the runner up in both 2015 and 2017. In 2015 he was beaten by Korea Republic’s Kim Donghyun, last year by Germany’s Dimitrij Ovtcharov. A difference and there is also a most significant difference when comparing contests between the two players; Xu Xin has always emerged the victor. He prevailed at the Liebherr 2013 World Championships in Paris, before succeeding last year on the Seamaster 2017 ITTF World Tour in Japan and at the Grand Finals in Astana. Furthermore, he is very much in form; some three weeks ago he won the Men’s Singles title at the Seamaster 2018 ITTF World Tour Australian Open, overcoming colleague Liu Dingshuo in the final, a tournament in which Ding Ning also reached the Women’s Singles final, losing to compatriot Liu Shiwen. In Panagyurishte an opponent from the new generation awaits Ding Ning; Wang Yidi, 21 years old, has never reached an ITTF World Tour Women’s Singles final and has never met Ding Ning on the international stage. It is somewhat the same for Liu Gaoyang and Zhang Rui in the Women’s Doubles title decider. It is their first venture as pair and for Zhang Rui as an individual. In 2014 Liu Gaoyang reached the final in Qatar partnering colleague Liu Xi; the duo lost to Hong Kong’s Lee Ho Ching and Ng Wing Nam. Equally as a partnership, for Kasumi Ishikawa and Mima Ito, it is only their second ITTF World Tour Women’s Doubles final; the one other occasion was last year in Panagyurishte when they emerged the champions. Somewhat differently for Masataka Morizono and Yuya Oshima it is their ninth ITTF World Tour Men’s Doubles final, of the previous eight, they have won six times. Notably both defeats have been this year. In Hong Kong they were beaten in the final by the host’s Ho Kwan Kit and Wong Chun Ting; most recently in Australia by the Korea Republic’s Jeoung Youngsik and Lee Sangsu. 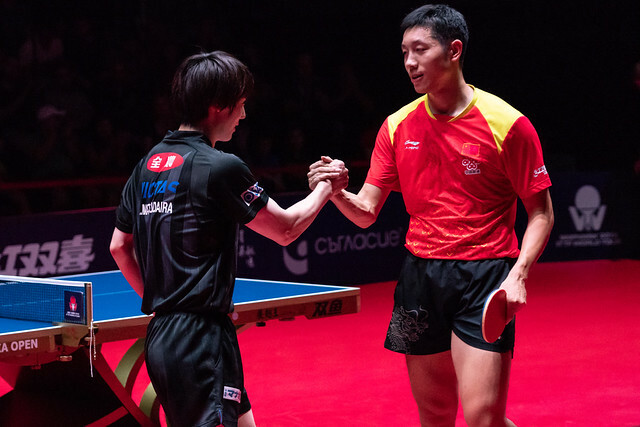 A most meritorious record but not quite that of Ma Long and Xu Xin, to date in the eight ITTF World Tour Men’s Doubles finals in which they have appeared they have won all eight. Earlier this year they won in Germany but on home soil in Shenzhen, they showed there were human; at the semi-final stage they were beaten by the scratch pairing of Romania’s Ovidiu Ionescu and Spain’s Alvaro Robles. The finals are due to start at 1.00 pm (local time) in Panagyurishte.